Jahnavi Mudigonda, Dongyang Xu, Vivian Wang, Muralidhar Padala. Emory University, Atlanta, GA, USA. OBJECTIVE: Decellularized bovine pericardium (DBP) fixed with glutaraldehyde (GA) is the current standard of choice, for valve tissue reconstructions in children. DBP-GA is inert due to the cytotoxicity of GA, cannot regenerate or grow with the child, and often precipitates Calcium leading to structural degeneration. Replacing GA with a biodegradable polymeric nanofiber mesh (NM) was attempted in this study, and the mechanical strength and regenerative potential of such a DBP-NM was investigated. METHODS: N=10 DBPs were prepared using 1% deoxycholic acid, and accelularity was confirmed. Part of the DBP was stored unprocessed, and the rest layered with 10:1 polycaprolactone-chitosan nanofiber mesh (NF). DBP-NF interactions were assessed with scanning electron microscopy (SEM), Fourier transform infrared spectroscopy (FTIR), & x-ray photon spectroscopy (XPS). Uniaxial, equibiaxial and step-biaxial mechanical testing were performed. Cells were cultured on both fresh DBP and NF layered DBP and tested in blood flow loops, followed by rodent implants. RESULTS: Fig A shows a prototype with the NF layer and DBP, with the corresponding SEM showing the two layers. Fig B depicts XPS and FTIR data, demonstrating formation of new functional groups between the NF and DBP. Fig C & D summarize uniaxial and biaxial mechanical testing data demonstrating significant increase in ultimate tensile extensibility of the DBP-NF, with strength equivalent to human valve tissue. Fig E demonstrates cellular viability after 48 hours of culture on the DBP-NF, and Fig F depicts very low platelet adhesion to the DBP-NF. 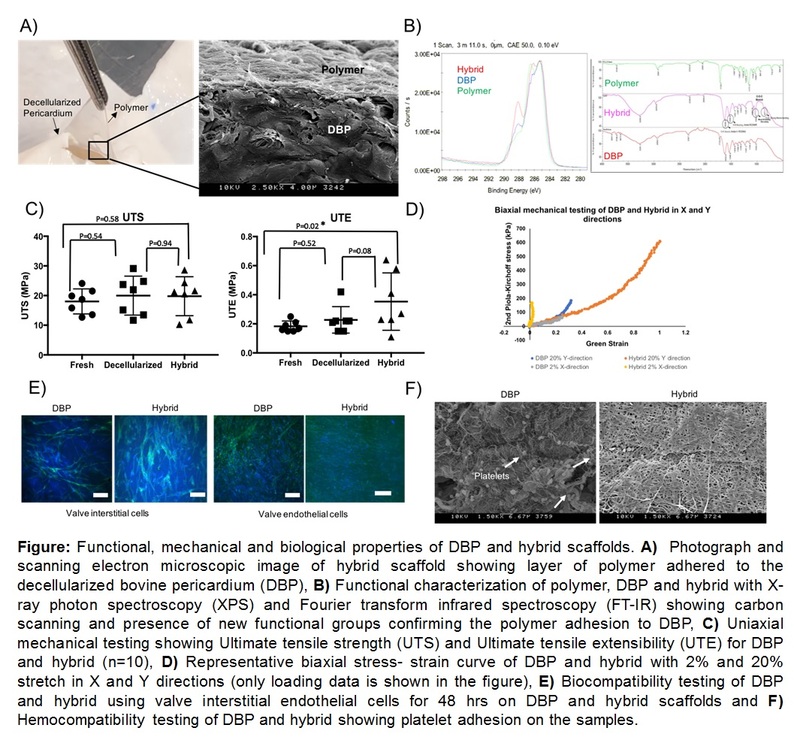 CONCLUSIONS: Replacing glutaraldehyde fixation with a layered nanofiber mesh can yield good mechanical strength and enable DBP regeneration, providing a potential cardiovascular tissue substitute for children.